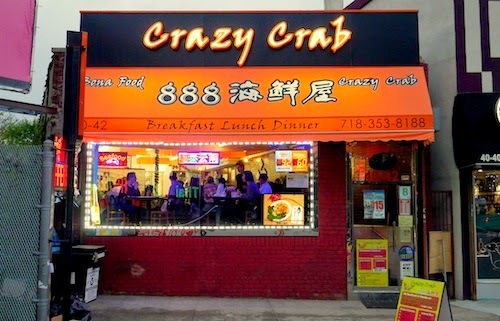 Crazy Crab is a difficult place to figure out. In it's interesting location right under the tracks of the Long Island Rail Road, it occupies a space that has obviously went through a few iterations. On the wall is a map of Mexico on a Corona advertisement, a beer they happen to sell as well. 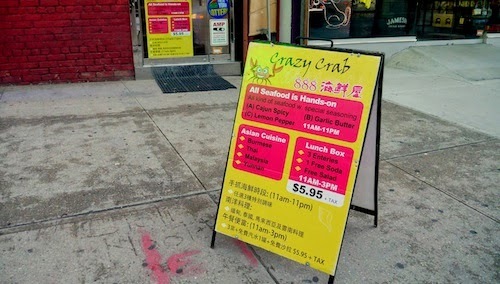 The menu and sandwich boards outside offer Burmese, Thai, Malaysian, and Yunnanese food, and of course the place has a specialty of crab. 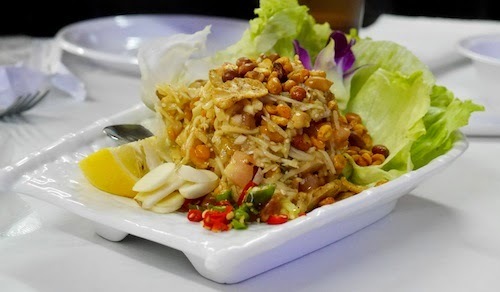 When I asked our server about the odd mashup, he told me "My boss is Burmese and Yunnanese and Taiwanese and brings back things she eats and likes." 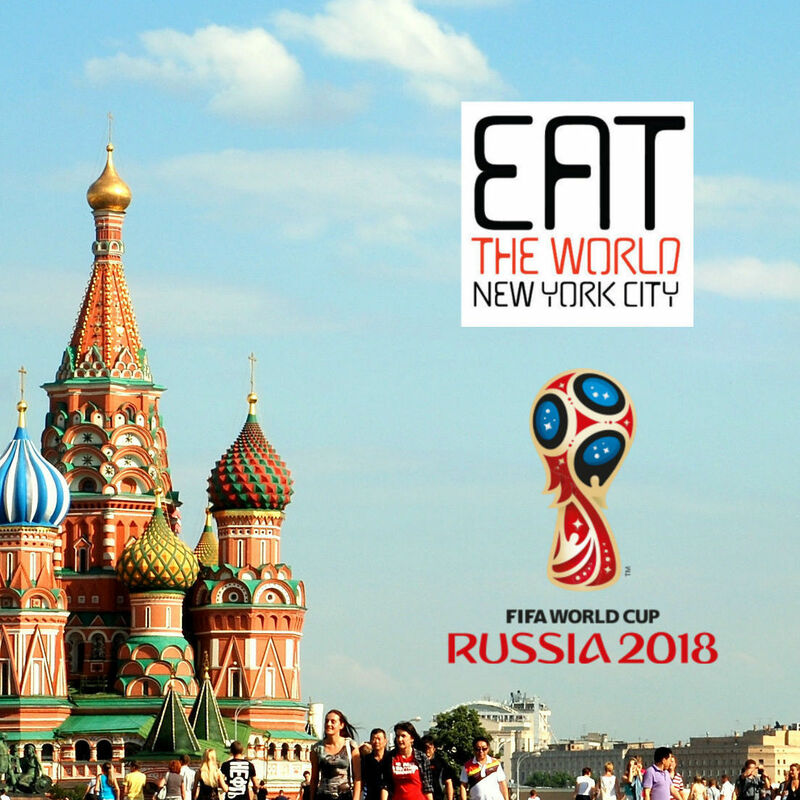 Food from Burma and the Chinese province of Yunnan could be called rare in New York City, so the proposition of the restaurant is definitely an interesting one, although the follow-through, at least so far, leaves a bit to be desired. 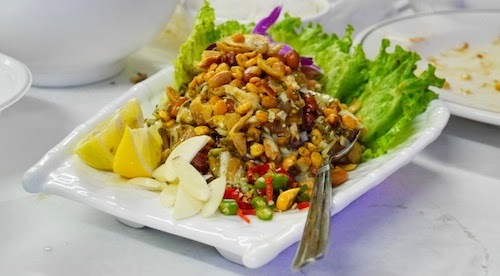 The mohinga ($8.95, above) is Burmese breakfast food, a fish noodle soup that is different at every street vendor you sit down with in their country. The version here is lifeless and mucky, I had to add all the lemon juice I could squeeze in, and plenty of red pepper. We had a bit better luck with the Burmese salads that are made here. The ginger salad ($8.95, below) is about half the right way towards what sort of crunchiness and crispiness a real version would have. 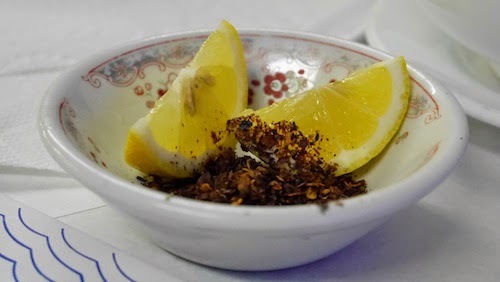 The tastes were decent in bringing back good memories, and the rest at our table seemed to enjoy it. The other, tea leaf salad ($9.95, above) was also enjoyed but made me feel a little like Uncle Scrooge. I would say it needed about five more flavors and three more textures to do its job properly. 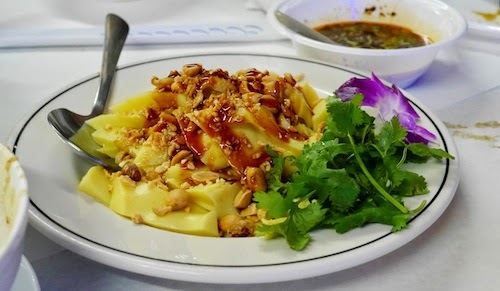 The Yunnan yellow tofu salad ($10.99, above) had no resemblance to the many Burmese versions I had right across the border. Not sure if that is because this is the style or they just cut corners here, but these lazy tofu hunks are just topped with something like hoisin sauce. The shredded pork with bamboo shoots ($8.50, above) is run of the mill Chinese food, but with that being said, was quite tasty. 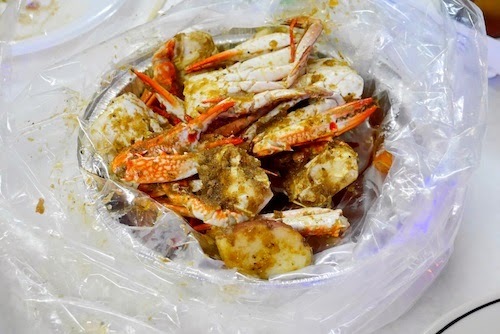 The crab is the specialty of the house it seems, and they certainly take it seriously, with buckets of seafood arriving wrapped in plastic bags. Plastic gloves are provided for all, and if you don't wave them off, they'll put on your bib for you. 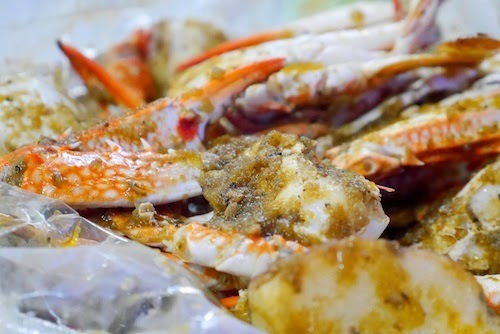 The blue crab ($11.95, above and below) comes with your choice of three seasonings. If you ask for their recommendation of the three, they will tell you that when they eat it, they mix all three together. The product of this, as seen in the photos, is what seems like a decent curry sauce. 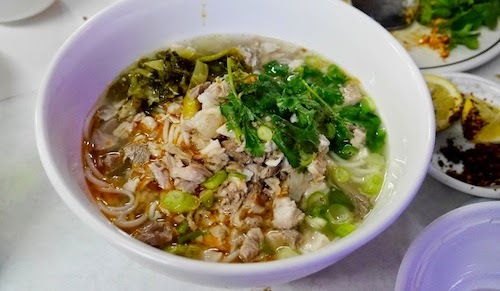 So after eating Burmese dishes with a spoon and fork, then crab with plastic gloves over hands, we move on to Chinese and chopsticks with an order of Yunnan rice noodle soup ($8.99, below). 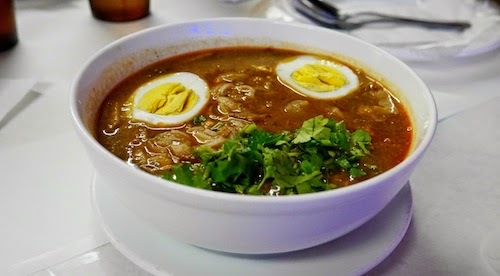 The spicy flavor nicely tops the neutral broth and pork chunks, while the noodles involved here strongly resemble spaghetti. So many nice things to say about this place Jared? Ok, so not really, but the craziness of the combinations and rarity of cuisines involved are definitely worth some words. 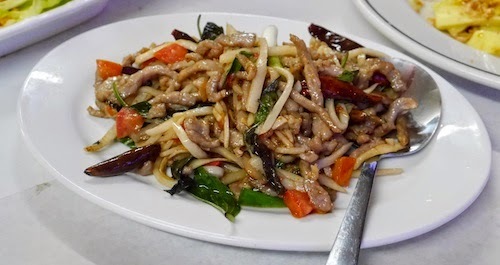 The clients here are just your average Flushing Chinese, and the brightly lit diner style and very friendly service are enough to consistently pack the place.